The "Take It!" Came from the discovery of what was so different about the lighting in the new refrigerator from the old one that had finally given out calling for this spiffy new replacement. 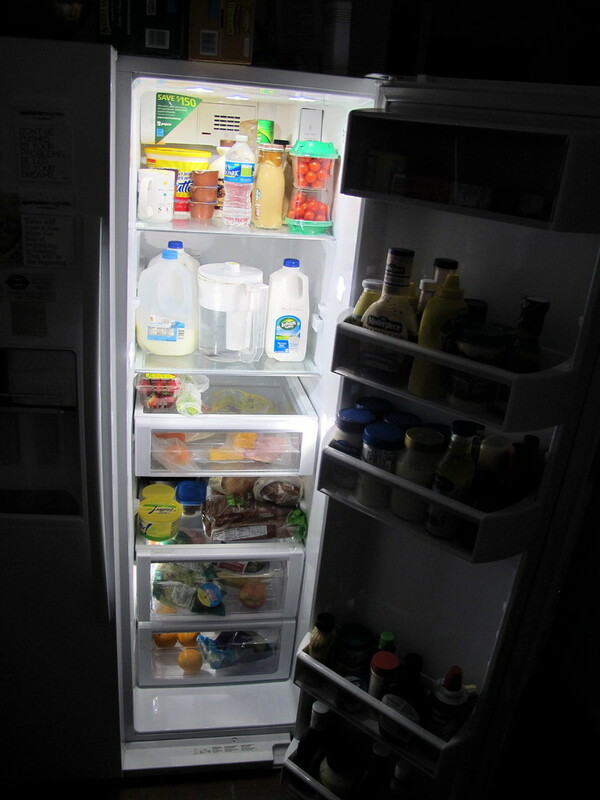 It was the multitude of lights through out both the refrigerator side as well as the freezer side. 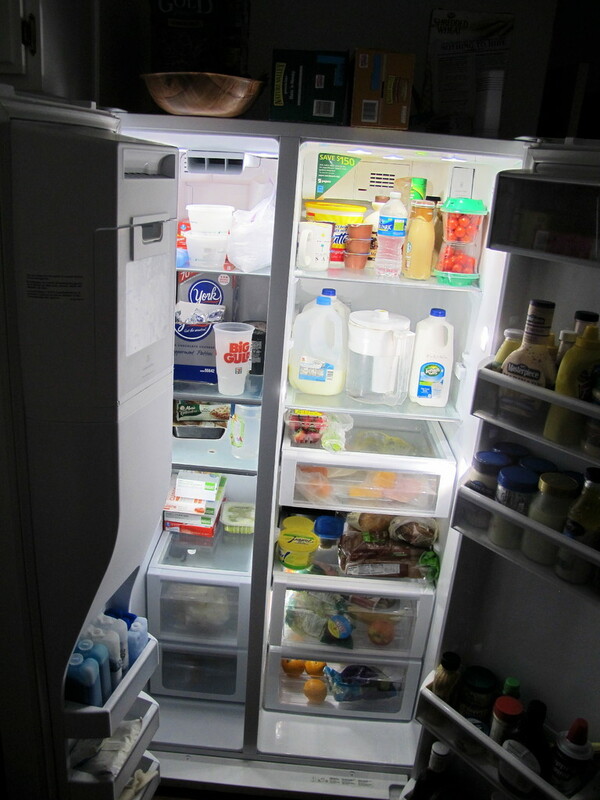 It used to be that I believe all fridges had one light in each section - and it was in the rear upper right corner. When this one light was lit when looking at it in the show room it was more than adequate ( because all the shelves were clear glass and there was nothing on them to block out the light - so the light shown right through all the way to the bottom shelf ). When the fridge was at home and full of stuff - it got harder to see what was what as one went to the lower shelves. I think they could have named the lowest shelf the "Pitri shelf" and everyone would have known just what was being spoken of. I am still overwhelmed by all the lights which actually start out on a dim setting and gradually move to bright after the door has been open for about 30 seconds. A nice touch for midnight raiding - lol. The After Take: To those whom I have shown these shots to - almost all laugh at the fact I took them so late at night. I beg off with saying, I went there for some filtered ice water - but no one believes me - lol. Here is hoping you get even more than the 23 yrs of service I got from my old fridge. I was sad to see it go - for it was almost like a long time friend. PS: I was so tempted to title this one "Dear in the headlights." Looks like a pretty nice fridge. 23 years out of a fridge is pretty long. My fridge doesn't even have a light in it, lucky! I am almost never getting filtered water from the fridge during the late night snack hour either. I got a crack up out of this one. Pretty high tech stuff. Does it have a tv on it too? I have seen refrigerators with tv's on them and I always wonder how they got the cable into the the refrigerator. Ahhh the pleasures of modern technology. A welcome addition to lifes necessities. Great fridge! You must be proud.